Whatever the weather, Britain’s first seaside resort is packed with things to see and do. 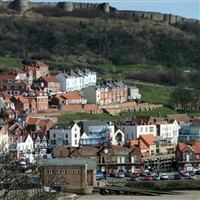 From golden beaches to traditional seaside amusements, boat filled harbour, castle, plus not forgetting the North Bay attractions. Whatever the weather, Britains first seaside resort is packed with things to see and do. From golden beaches to traditional seaside amusements, boat filled harbour, castle, plus not forgetting the North Bay attractions including Peasholm Park and Sealife Centre.